Please contact Customer Service for price and shipping information. This product is only available to ship within the continental United States. 16 inch rotating illuminated seasonal globe. 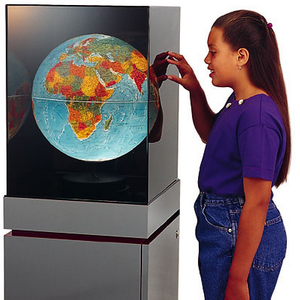 A visual marvel and a one-of-a-kind teaching tool, this globe is a child-magnet. Our customers have been raving about the handmade Blue Planet Globe since we first introduced it. We believe it to be the most effective, captivating way to teach people about their planet and the seasons. These individually handcrafted spheres are lit from within, yet ingeniously shielded so that only half of the planet is visible as the globe turns -- perfectly recreating how sunlight illuminates the face of the Earth. In museums around the world, viewers stand transfixed by the sight of their planet, spinning quietly in the darkness. Watch the Earth automatically rotate over a five minute interval, simulating the changing patterns of sunlight falling over each hemisphere during an entire year! 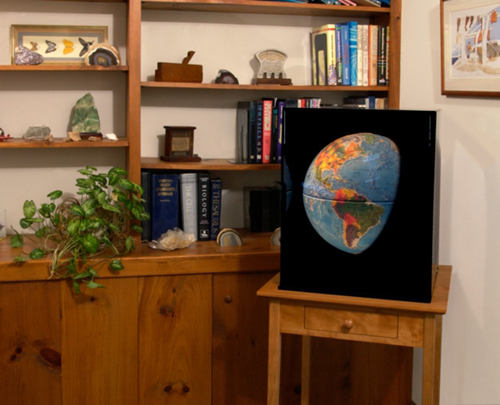 The smoked plexiglass cover makes this unique display even more spectacular, by creating the illusion of Earth floating in space. This unmatched perspective of our world is a marvelous learning experience for classroom or personal discovery. Includes controller and plexiglass cover (measures 23"H x 17.5" x 17.5"). Minimal assembly required. Plugs into 120V outlet. Globe is custom-built and shipped directly from the artist; allow four weeks for delivery. This item is available only in North America and cannot be shipped to P.O. boxes or APO/FPO addresses.